The new model range from Remoska introduces the Remoska Grand R 22 F and the Remoska Standard R 21 F with a window in the lid. This makes easy viewing while cooking without having to lift the lid. These new models carry a 3 year warranty. Tailor-made to fit either the Remoska Grand or Remoska Standard pan, the stainless steel rack lifts food closer to the heat source for super quick cooking, so food like pizza and toasted sandwiches will be cooked in much less time. Turn the rack over, and it will raise food from the base of the pan, allowing fat to drip through for healthier eating. 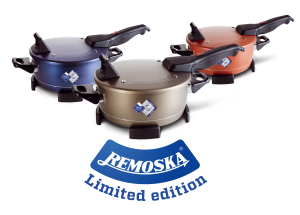 Remoska have now launched their range of new models in vibrant colours with colour coated Teflon®. These new models have multi-layered, non-stick Teflon®Select from DuPont for higher quality and better performance. The three models shown are Champagne Gold, Hot Chilli and Blue Lavender. Both the Remoska Standard and Remoska Grand are available in these colours by special order as they are not a stock item. Please contact us for further details. Copyright ® 2019 | The Remoska is CE certified, meeting European Product Directives Legislation. 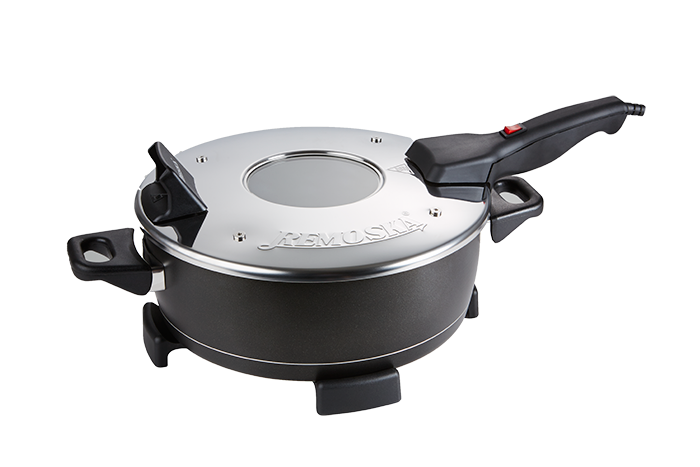 The Remoska is manufactured under ISO1400 and 9001 certification.